This DVR accepts up to 4 hard drives. The more hard disk space, the more video you will be able to record. Select the amount of video storage you would like below. This 32 Camera DVR accepts five different types of videos signals, allowing use of the latest security cameras without having to discard your older cameras. If you're looking to build a new security camera system or upgrade your existing DVR, this unit is perfect for either. If you need more than 32TB of storage space, then you may want to consider its larger sibling the 32 Channel Enterprise DVR that can hold up to 64TB. HDCVI - you can choose from our selection of HDCVI cameras here up to 1080P resolution. HDCVI/TVI signals allow for PTZ controls to be sent over coax wire. AHD - our 4 in 1 cameras allow output of this signal type, however AHD is not very popular in the USA. TVI - our 4 in1 cameras allow output of TVI signals. IP Cameras - you can select from any of our IP cameras here up to 5MP resolution. It supports up to 128Mbps of IP camera encoding bandwidth. Analog Cameras - these are standard definition security cameras that you probably already have if you are upgrading to HD. This 32 Camera video recorder supports any combination of the above five camera signals up to 32 channels. It allows channel type to be changed for each channel so you can have a heterogeneous mix of cameras, see here how it is done. You can switch channels between coax and IP input type. For IP cameras you will need a PoE switch to power and send data/video to establish a network between the cameras and the DVR. Most importantly, this 32 camera Tribrid DVR supports IP cameras on each channel. Don't be fooled by competitor Tribrid DVRs that support only up to 2 or 8 IP cameras on their Tribrid DVR. The 32 Channel XVR also allows you to select the resolution you would like to record for each camera independently, and set motion recording and motion areas. You can also set highly customized recording schedules for each channel based on your own preferences. The customizing options are limitless. To conserve hard drive recording time this DVR has the latest H.264+ video compression technology that records great quality video while saving up to 50% storage space compared to conventional H.264 encoding. This security DVR recorder also offers PTZ control of compatible HDCVI PTZ cameras using Video/PTZ Data communication over the same coax wire, eliminating the need to run an extra 2-lead wire for RS485. It has two-way audio talk functionality where you can connect a microphone and speaker to hear from and talk back to one location. There are 4 audio inputs that allow you to tie in a security camera microphone. Adding a security camera with microphone is easy. This recorder support audio over the HDCVI signal, meaning you can use a HDCVI camera with built-in microphone to capture video + audio over the coax wire. Backing up video is also very easy. You can backup to a USB drive or over the network to a computer. Remote viewing your security cameras is easy with our Free Apps for iOS, Android, Windows and Mac. This high definition DVR supports up to four 8TB hard drives for a total of 32TB of storage; you can select the suitable hard drive size above for your security needs. If you need help, you get free tech support with your purchase from CCTV Camera World. Dimensions 17.3" x 16.4" x 3.0"
On your 32 CH DVR NVR Tribrid, is the IP Cameras connected through the network or do that have to be connected through BNC with an adapter? You would connect IP cameras from your network switch or router. BNC inputs on the back are for connecting analog security cameras or hdcvi cameras. IP cameras would need to be connected to a PoE switch first, and then this DVR would also connect to that switch or another switch on the same network. Please note this is not a PoE NVR where there are RJ45 network jacks on the back for connecting IP cameras only. Are any IP cameras compatible with this Tribrid system? In particular, we use GeoVision IP cameras and just want to ensure these cameras will be compatible with this DVR. All of the IP cameras we sell are compatible with our Tribrid DVRs. Third Party ONVIF ip cameras are compatible as well, however ONVIF does not guarantee passing of all functions like motion detection, audio or PTZ controls. Depending on the 3rd party manufacturer, they lock our functions on their equipment, prohibiting use with other equipment. 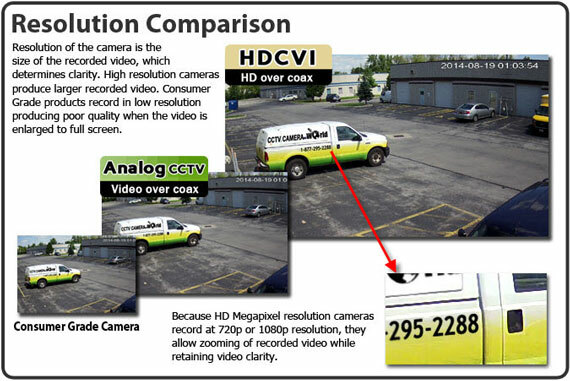 There are a lot of driver negotiations involved with IP cameras, and not every brand keeps up with making sure their cameras are compatible with every NVR out there. You can also use our ip camera compatibility list for reference. We have heard positive feedback from customers using Geovision cameras purchased Jan 2015 or after being compatible with our Tribrid recorders and NVRs, however there is no passing of motion events to the recorder due to the camera firmware. Can I use these cameras? which cameras do you recommend as I have 20 camera systems. Yes the samsung sdc-9441bc will be compatible with our 32 channel XVRs. You can also use any of the 4-in1 security cameras and hdcvi cameras we carry. How does the Windows software work? Can I see a video example of it? You can watch videos of how our camera software works by view demo videos here. If we purchased a Tribrid 32 channel DVR and a Tribrid 16 Channel DVR. would we be able to network them together, if they resided in different areas of the same building? Please note two DVRs or NVRs cannot be connected to act as one unit, however they can be viewer together using our client software on Windows or Mac as shown here.